A'pieu has just released three kinds of lip products for this summer: the Long Wear Creamy Matt Lipstick, the Long Wear Essence Lipstick, and the 1-2-3 Perfect Lips. It hasn't been that long ago since I wrote about the Korean dupes of the YSL Glossy Stain, but the 1-2-3 Perfect Lips is also a lip product that is a lip gloss, lipstick, and lip tint in one. I really like the color range of the A'pieu 1-2-3 Perfect Lips. As a matter of fact, I wouldn't mind getting the whole upper row of shades ^_^. As like the other two A'pieu lip products in this post, the color of the A'pieu 1-2-3 Perfect Lips is buildable. By applying one light coat, you get very light pink lips and the intensity of the color increases with each coat you add. 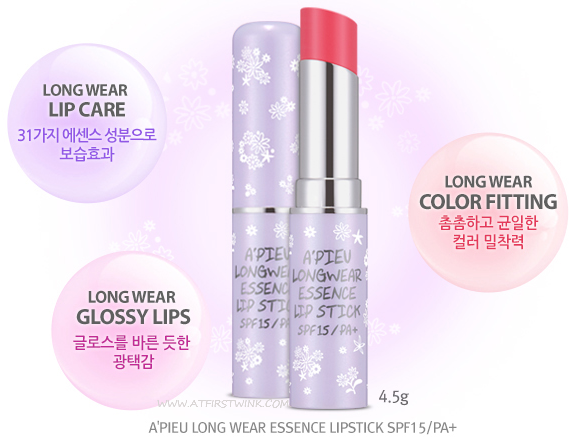 I am always on the look out for more nourishing lip care products (even though my lip balm collection is very large ^_^) and the Long Wear Essence Lipstick is something I would love to add to my collection. Anything that is a glossy and moisturizing is already qualified to enter my beauty case, but the good thing is that it also gives a lot of color to the lips. After seeing the beautiful, matte effect of the Missha M Ever Lasting Lacquer Rouge and the eSpoir Lip Stain Whip Mousse, I am not that reluctant to try matte lip products anymore. My lips are naturally too dry to have colored, matte lips and still look pretty. That's why I was so blown away by the Aritaum Wannabe Cushion Tints that gave my lips a semi-matte finish. The new A'pieu Long Wear Creamy Matt Lipstick seem to have a similar texture. You can apply it lightly, making it look powdery matte and with still a lot of color pay off, or apply it fully to get a lipstick like result and with a very slight glossiness.